The 100th birth anniversary of Senator Murugeysen Tiruchelvam QC, former Cabinet Minister and Solicitor-General took place on the 19th of November. 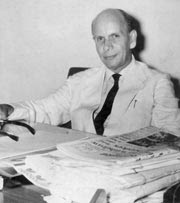 Mr. Tiruchelvam was the only member of the Federal Party to become a Cabinet Minister. We reproduce a condolence speech on Mr. M Tiruchelvam QC, Parliament,26th November 1976 by Mr. Ranasinghe Premadasa, the then MP for Colombo Central. Mr. Premadasa had previously served as Mr. Tiruchelvam's Deputy Minister. Mr. Speaker, we are confident that no one would object to the time that this Assembly spends to express sorrow on the untimely death of the former Local Government Minister M Tiruchelvam, Queen’s Counsel. All sections of this house accept Mr. Tiruchelvam as a person who should deserve such an honour. When you keep close company with a leader, your impression changes. Also, if you observe someone from a distance one gets a wrong impression. The closer one is to a person, the more accurate ones impression. My opinion of Mr. Tiruchelvam grew with the degree of my association with him. Initially, when I was appointed as Mr. Tiruchelvam’s Deputy Minister in March, 1965, I feared that he was a person with narrow, communal ideas. Having served as his Deputy Minister for Local Government from March 1965 to September 1968, I can clearly stated that Mr. Tiruchelvam was not a narrow-minded leader but a person who focused on the national good. Mr. Tiruchelvam was a thorough gentleman, who had deep ideas on the welfare of the public. Even those who did not share his political programme of federalism, should accept that he was a noble leader with a broad mind. I am aware that the majority of the staff members at his residence were Sinhalese people. He had a special affection for the Sinhalese people. He believed that the Tamil people, had the right to live in this country with self-respect. He saw no conflict between his loyalty to the Tamil people and his loyalty to the country. As the Minister of Local Government in the coalition government led by Mr. Dudley Senanayake, he acted completely impartially. He decided on every question, with the correct object in mind. I wish to state that Mr. Tiruchelvam valued the unity of the country and communal amity. However, Mr. Tiruchelvam could not bear injustice. He was concerned about the injustice that was meted out to the Tamil people. All of us should share his concern for justice. None of us are aware of which community or caste that we will be born in. Hence, Mr. Tiruchelvam felt that no community should be classed differently from another. Mr. Tiruchelvam worked fearlessly according to his conscience. Mr. Tiruchelvam was a dignified person to keep company with. He was not arrogant about his position and his intellect. He was prepared to listen to anyone. Although he had ideas of his own, he was tolerant with those who disagreed with him. Despite his status as a Queen’s Counsel and a Cabinet Minister, he could keep company with the ordinary people. Mr. Tiruchelvam death is a moment of great sorrow for this country. He worked hard to unity the Sinhala-speaking people and the Tamil-speaking people. Unlike others, he was not bound by narrow political concerns. He valued national unity and communal amity as a paramount objective. He said this on many occasions. He also did everything according to his conscience and his noble principles. We completely endorse the condolence motion presented about this peaceful and great son of Lanka, who had lofty ideals and high intellect.